In response to calls for increased security from enterprise clients, Apple has hired cybersecurity expert and author David Rice as its director of global security, a new report claims. Several sources have confirmed Apple's recent hiring of Rice, who is expected to start work at the company in March, All Things Digital reports. A "deeply respected name in IT security circles," according to those who know him, Rice is reportedly being brought on to bolster Apple's security and gain the trust of corporate CIOs. Rice graduated from the U.S. Naval Academy in 1994 and received a master's degree in Information Warfare and Systems Engineering from the Naval Postgraduate School. He previously worked as a Global Network Vulnerability analyst for the National Security Agency and as a Special Duty Cryptologic officer for the Navy. Currently, Rice serves as the Executive Director of The Monterey Group, a strategic consulting firm, and Consulting Director for Policy Reform at the U.S. Cyber Consequences Unit. 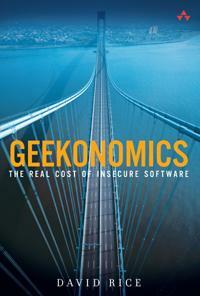 Rice is also the author of "Geekonomics," a 2007 book which likens software security vulnerabilities to weakened bridges and other physical infrastructure. Apple has ramped up its security efforts in recent years, in part to gain the trust of corporations and government agencies who have begun adopting the iPhone and iPad. As the iPhone maker has upgraded the security of iOS, it has found itself gaining ground on Research in Motion, the self-professed leader in "CIO friendliness." Last year, Apple recruited the former security chief for the Mozilla Corporation and security lead for Microsoft's Windows XP Service Pack 2 as a senior security product manager. A recent partnership with Unisys is also meant to boost Apple's security reputation. In an interview last October, a Unisys executive said the deal came about because his company had "put a lot of heavyweight engineering into securing the [iPhone], which, frankly, no one else has figured out yet." Apple has already made significant progress in the enterprise market. In its earnings call for the first quarter of fiscal 2011, the Cupertino, Calif., company revealed that over 88 of the Fortune 100 companies are now deploying the iPhone and more than 80 of the Fortune 100 are already deploying or piloting the iPad.